Broom boats have a long and distinguished history in the design and manufacture of sailing & motor boats, initially producing wooden sailing boats that were popular amongst local sailors for exploring the nearby Norfolk Broads. In more recent times, Broom has championed the creation of the aft cabin cruiser which, whilst still ideally suited for inland waterways with low air draft and spacious accommodation, is equally at home in the open sea and as a serious cruising vessel. Middle income to high income based boating enthusiasts. However you can pick up a bargain day run-around broom boat if you go for an older year build. The Broom company started manufacturing boats in 1898 under the leadership of one Charles J Broom. The wooden sailing craft he manufactured were well respected and by the early 1900's, when visitor numbers to the broads called for boats to be available for hire to visiting tourists, and Broom thrived, proiducing their wooden sailing craft in great numbers. By the 1930's, the demand for hire craft lead Broom to begin manufacturing Motor cruisers, whose success led Broom to be approached by others to build bespoke boats for private individuals. During the 2nd world war, Broom did not close down like other brands, instead being approached to use their skills to build launches, lifeboats and tenders for the Royal Navy, a step that strengthened Brooms position as a fast and efficient production facility. In the 1960's Broom were amongst the leaders in using fibreglass as the principal construction material for pleasure craft and they have not looked back since this point, being acknowledged leaders in the production of aft cabin cruisers for both coastal and inland waterways. This beautiful cabin cruiser sets new Broom boat standards. It features the new Volvo D series range engines which offer lower fuel consumption, lower noise levels combined with improved system performance. The deck for this boat is designed with safety in mind, with reduced slip surfaces combined with safety rails and hand holds. The saloon holds a beautiful U shaped settee surrounded by beautiful interior with incorporated storage space. Large panoramic windows add a sense of space throughout the saloon. 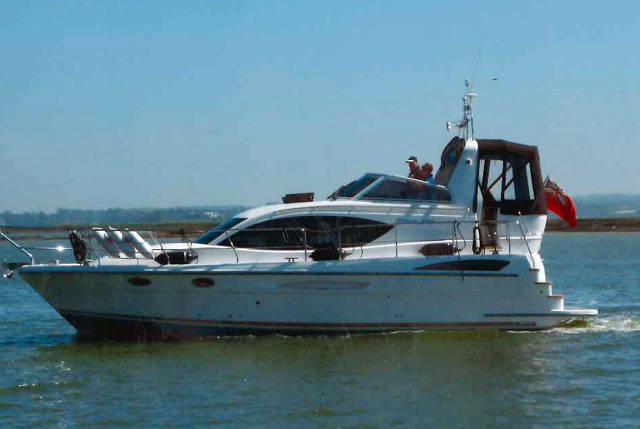 This boat has two cabins, one with two twin berths surrounded by storage space and the master cabin with a large double bed and en suit toilet.